We’d love your help. Let us know what’s wrong with this preview of Queen of Chaos by Kat Ross. As the dark forces of the Undead sweep across what remains of the empire, Nazafareen must obey the summons of a demon queen to save Darius's father, Victor. Burdened with a power she doesn't understand and can barely control, Nazafareen embarks on a perilous journey through the shadowlands to the House-Behind-the-Veil. But what a Persepolae has fallen. To ask other readers questions about Queen of Chaos, please sign up. Please meet what has in fact become one of my favorite series ever. I usually favour a book (of a series) over another but this is honestly the first time that I love all of them unconditionally. This book as its predecessors has a thick plot, with no lack of fun moments, twists and jaw dropping revelations. I didn't see them coming...not at all,which is a good thing on itself. Balthazar confirmed himself to be one of those wonderfully grey characters. He and Lysandros (who, by the way, totally grew on me) definitely deserve a spin-off. The final showdown between Neblis and Nazafareen didn't go as I had expected, it surprised me in the best way possible * definitely thumbs up from my side*. The origins of daevas are finally revealed. I won't spoil anything, just know that all in all the worldbuilding as a whole is beautifully imaginative and well detailed. Now let me tell you about the OTP of my heart a.k.a. Darius & Nazafaren. Alone they are two wonderful characters, together they're amazing it is hard to put feelings into words. I really can't bear the thought of saying goodbye to them. I won't, I refuse to!! Luckily, the heartbreakingly beautiful and bittersweet ending leaves enough space for possible sequels (The ending was also extremely appropriate *sighs*). What I did like: Everything. Final verdict? 5 + stars. Really good but I am a bit disappointed about this one. On a good note, the author says in the afterword that there is another in the series coming so I hope that one will be better. I didn't care for all the time spent on secondary character Tijah and the devea children. I wanted more of Darius and Nazfareen (spelling?). I hated that Nazfareen lost her memory, I hated that she and Darius are no longer bonded. But I am glad they still know they still love each other and are alive. In short, I was upset that they story didn't go the way I wanted, but that doesn't make the book bad, it just makes it frustrating. The ending was a bit gyp but I am hopeful that the upcomming book will elaborate on the loose ends. From what the author says, the next book is going to center on Tijah and her bonded as they search for the gates. This saddens me because I want more of Darius and Nazfareen. The good thing is, they are supposed to be in the next book, but not as MC's. Regardless, this author is an exceptional writer who has excellect world building skills and is brilliant at character development. I love her antagonists the best. She gives them such depth of which I have rarely seen in any other book. Well, at any rate.. star off for too much time spent on secondary characters and children, and the lame ending. I would still recommend this series, count is as an all time favorite, and will definately read the upcomming books. She is also now on my fav author list. Safety- I think it's safe to say both MC's were virgins - 1st last and only. Because it is not spelled out clearly I did not tag it as such. There is violence with some detail and cursing. This is the third book in the Fourth Element Series. The first book Midnight Sea starts off with a girl named Naza who joins the Water Dogs to learn how to fight Drujs after her sister was killed by one. Water Dogs are bonded with magical cuffs to Daevas so they can control them and use them as a weapon. Many in the kingdom believe the enslaved Daevas are dangerous Druj but not everyone agrees with this. Some places believe they're Djinn but they still use the cuffs to control them. I loved the m This is the third book in the Fourth Element Series. The first book Midnight Sea starts off with a girl named Naza who joins the Water Dogs to learn how to fight Drujs after her sister was killed by one. Water Dogs are bonded with magical cuffs to Daevas so they can control them and use them as a weapon. Many in the kingdom believe the enslaved Daevas are dangerous Druj but not everyone agrees with this. Some places believe they're Djinn but they still use the cuffs to control them. I loved the magic system in this trilogy. Daevas can control air, water and earth but the humans wearing the cuffs can block them from using their powers. Using to much of any one element has severe physical consequences on Daevas. Only one out of a thousand humans have the spark required to wear the cuffs. The bond also allows them to feel each others emotions. Even though fire kills any Daeva who tries to control they still get tempted to use it if the flames are too close. I enjoyed reading Tijah perspective as much as, if not more than Naza and her Daeva Darius. I really liked Tijah relationship with the children and Achemese. I appreciated having one of the main characters be a poc. Queen Neblis made great antagonist. She commands the Necromancers and taught them to control the undead Druj using magical chains on humans they've captured. I loved the Necromancer Baltazare in this book. He had a wonderful character arc and I loved reading from his perspective. Overall the characters were well developped. I liked the addition of new characters throughout the series and the references to historical figures. The pace wasnt too fast or too slow. We get action and time to see the characters grow. There were some moments in here that really gave me the feels. The world is a lot bigger than I first believed. We also get a lot of questions anwsered in this book. This is definitely a gem of a series. Its just as good as some of the bestselling books Ive read. Это все, что вам нужно знать, чтобы хотя бы попробовать. Единственный для меня минус остался в первой книге (эти начальные перескоки во времени), а потом... Потом я смеялась, рыдала, переживала, кричала, грызла ногти, рыдала. А главное - удивлялась. В последнее время в пределах жанра со мной такое случается все реже. Спасибо автору за мир и за героев. И за обещание вернуться - пусть не к Дарию и Назафарин, но в древнюю Персию и к другим, не менее интересным персонажам. Блин, да тут даже антагонистов хотелось прижать к груди и никуда не отпускать, ибо привыкла, прикипела, приросла. Dude, I love this series! Everything about it is just so damn good. The writing, characters, premise and those damn stunning covers. Look at the cover for Queen of Chaos. No. Seriously. Just look at it. My jaw dropped the first time I saw it, and I still haven’t been able to put it back to its place. It’s one of the most beautiful covers I’ve ever seen. But don’t worry, this isn’t the case of a book with a stunning cover and an awful story inside. Or the contrary, everything about Queen of Chaos was beautiful. First of all, we start with Tijah’s POV and OMG it was everything I needed and a little more. I know Nazafareen was supposed to be the star of the show and all that, but Tijah completely stole the spotlight as far as I’m concerned. She’s perfection. And let’s be honest, it was a smart decision on the author’s part. Look, after two books focused on Nazafareen and Darius, it was a much needed breath of fresh air to start this one with Tijah and the newish characters. Plus, like I said before, Tijah can do no wrong. Her pain and her guilt and her journey…. Everything worked brilliantly. I have a serious girl crush on Tijah after reading this book. She was so complex and rich. Her loss was so raw—I wasn’t sure I’d be able to forgive Kat Ross for what she did last book with Tijah, but now that I see where it took her? I guess I can understand…I’m not ready to accept it, yet, but I definitely understand. Plus, it gave me a new ship. Dude, I ship Tijah and Achaemenes like there’s no tomorrow. And her friendship with Anu? It was adorable. I was also super excited to hear there’d more of them coming in a spin-off series—more on that soon. I need more because while I love that Tijah went down the warrior path—the only path I can see for her since she’s such a badass—I wish I’d seen more of her exploring a romantic side. I need more of my ship. Another character who completely stole the story for me? Freaking Balthazar. I’d already mentioned him on my review of Blood of the Prophet, but his journey was even more interesting in this book. I LOVED how complex Balthazar is. He’s not evil, but he’s not pure, but he does evil things while he wants to do good things and… and… Balthazar makes me feel so much that I can't even figure out what I’m feeling most of the times. I absolutely adored the conclusion to his arc in this series. The redemption journey was fantastic! And I love it even more that it isn't exactly the last we’d see of this super complex character —again, more on that soon. While Tijah and Balthazar stole the show, Nazafareen and Darius were still extremely important to the story. “And I would gladly suffer every moment of torment they gave me over again if it meant I was finally brought to you.” >> Darius making my ovaries explode. Nazafareen continued to be super likable by risking herself (although sometimes I wanted to shake her because she made the stupidest decisions ever) and by not thinking that the world revolved around her, even though she was more powerful than most of the people she knew. I mean, she was the only one (aside from the Prophet) who could work with all four elements, but did she go around acting like the whole world should kiss her feet? Nope. She was too busy trying to keep her magic from making her crazy while she had to march Behind the Veil, stop the Undead Queen and save her father-in-law. Our dear Nazafareen is impulsive and takes unnecessary risks – even her mother knows so and said that a hundred times--, but she’s also a fighter. I love that about her. Was I a 100% happy with the turn of events and how her story “ended”? Not exactly. Was I unhappy? Nope. Because I see where this can take her, and I'm hoping this isn’t the end of their story, so that makes it better. I did have some minor "issues" (not even the right word here) but they were really small compared to how great the story was. One thing I'll say is I wish there’d been a different way to tell some parts of the story so Molon and Lysandro’s POVs weren’t needed. Not that I disliked those chapters, but I just found adding even more POVs unnecessary. Now… Minor spoilers coming. So, WARNING!!! (view spoiler)[I was also a bit confused as to the whole thing involving the lands of Avas Danai and Avas Valkirin. Was it were all the daevas had come from? Are all daevas on the Sun Lands either the group that came with Victor or descendants of that group? I mean… it’d make sense that they’d come from there since there’s no fire—the only deadly element to them—there. Right? I have to say I was more than happy to read the "Note To The Reader" and learn that, while the author planned for this to be a trilogy, she isn’t done with this world and these characters because, guess what, neither am I. 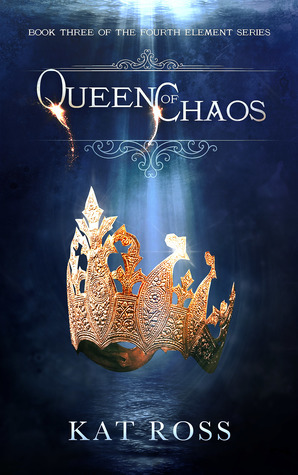 Queen of Chaos is an amazing conclusion to the plot introduced in The Midnight Sea, with all the characters getting a satisfying journey and their happy(ish) endings. But I can definitely see room for more. I don’t know about you, but I’m ready for whatever Kat Ross writes next. Queen of Chaos is a richly imagined, intensely engaging and simply inspiring novel. On this last book of the Fourth Element series, we will already know where Daevas really came from, how Neblis was able to create those evil druj, and how Nazafareen have that power just like the Prophet. Aside from those, we will also see what happened to Victor on his journey to Neblis’ kingdom and what happened to Tijah and the children daevas she was with when Nazafareen and Darius leave them to follow the P Queen of Chaos is a richly imagined, intensely engaging and simply inspiring novel. On this last book of the Fourth Element series, we will already know where Daevas really came from, how Neblis was able to create those evil druj, and how Nazafareen have that power just like the Prophet. Aside from those, we will also see what happened to Victor on his journey to Neblis’ kingdom and what happened to Tijah and the children daevas she was with when Nazafareen and Darius leave them to follow the Prophet. This book answered all my questions on the first two books in the series. This was one of the best series so far that I really liked and the author writing skills just contributed on it. The way she wrote it, just like what I’ve said on my last review, was great. It really helped that the author could write a story that will show you the story itself by describing its vast world and characters and even showing you the emotions of each characters. I also like how each scenes were all connected on the previous scenes from the last two books. So, if you’ve read the first book and you’ve got lot of questions about it, then I really suggest that you finish it until this novel so you wouldn’t be left wondering. Another thing I’ve liked on this series was the added themes and how I could read those nice bits of history here. The characters never failed to amuse me. On this book, I’ve got to learn the history of some characters and learning about it was fascinating. When I’ve read those part that showed their past, I was really surprised on how it all make sense. I just didn’t like how it ended as there was so much to tell us but I was glad to know that everything would not really end on this book. I’m happy to know that there would be another book that would show how the adventure of Tijah and her company will go and what happened to Culach and the other characters. I am really suggesting for you to read this series because this will definitely make you like the world I’ve entered. This wonderfully written book will just stay with you until the last page. In tutta sincerità mi aspettavo una conclusione più appropriata! Non che sia stata una brutta conclusione, ci mancherebbe, ma non mi ha soddisfatto, per niente. Prima di tutto, questo è il libro di Balthazar e di Tijah. Il primo scoprirà di non essere ancora perduto, la seconda saprà superare la sua perdita e compiere ancora molte gesta. Avete capito bene. Qui le gesta di Nazafareen e del suo legato sono ridotte ai minimi termini e quel poco che succede, seppur molto significativo, non viene per nulla approfondito e la cosa mi ha lasciata basita. Si, la giovane Nazafareen è il nostro distruttore e si ritrova, per cause che non vi dico altrimenti farei spoiler, tra i ranghi della perfida regina Neblis (che poi anche lei viene sconfitta in maniera piuttosto semplice e diciamocelo pure barbina! ), ma niente di più. Poca azione, da parte della ragazza, solo gesta fatte di petto, senza pensare, che porteranno allo sfacelo. Diciamo che in questo volume, Nazafareen non ci fa una bella figura, ecco. Victor sarà pure bello e potente, ma è ridotto alla bella statuina, cosi come la sua consorte che è talmente acida (anche nei confronti del figlio), che se fosse perita non me ne sarei curata. Insomma, niente grandi battaglie, né scontri fenomenali come ci aveva promesso la trama è questo mi ha deluso enormemente. Questo non significa che non sia stata una bella lettura! Sia Balthazar che Tijah sono stati dei protagonisti molto interessanti e ben costruiti, lo stile dell'autrice è senza ombra di dubbio coinvolgente e avvincente, ma io volevo di più, volevo scoprire molto di più. This book made me furious. I could give it either two stars or four and both would represent my feeling about it. Let's start with the good: the book itself is very good, the world is well though and original, a mix of history and magical elements. It was fantastic to read about real historical figures following their actual path in a fantasy scenario. The secondary characters are amazing, the reader comes to feel real strongly for them. And there comes the flood. My anger. My: how could you skip This book made me furious. I could give it either two stars or four and both would represent my feeling about it. And there comes the flood. My anger. My: how could you skip the second lesson of creative writing? Where was the editor? Why it seems that nobody else had noticed that? As I said the secondary characters are amazing, so amazing that the author is much more interested in following them than following the main characters. The subplot completely overcomes the main plot to the point where the reader can describe what each secondary character is doing(and there are many of them) but has only a vague idea what is happening in the main plotline. I'm not kidding you and I'm not exaggerating, Nazafareen is present in less than 10% of the book. And not because she is stuck somewhere or something like that :she is on a mission to fight the main bad girl and save the day and unleash her power. The main plotline is condensed in something like 40 pages all throughout the book. She has very short chapters were everything happens so quicky that I feel lost and confused. Here is the third rule of creative writing: you have a protagonist, you have to stuck with him/her. Imagine if JKR decided that: You know what? Harry is starting to bore me.Let's change Pov. This last book is even worse than Ivanhoe, the other book that talks about anything but Ivanhoe. It's like reading Waiting for Godot, with the difference that this is not a masterpiece of absurdity, it's the ending of a trilogy. I want to read about the protagonist. I am here for her. The whole part with Tijha could have been a fantastic new serie. A serie I would have gladly gave a high rating. Fan-fricking-tastic end to this trilogy. Kat Ross has done it again. I was completely sucked into this story and cared about characters, even when I didn't want to! The details and descriptions of the world are some of the best I've ever read. You would think I would have really liked this volume because I'm always complaining that the secondary characters are more interesting than Nazafareen and Tijah, but somehow it still wasn't that great. I think just because the plot was all over the place. I loved that we saw more of Victor, Lysander, and Delilah but that meant we were following like eight different characters and jumping back and forth all the time to the point where I wasn't really sure what was going on most of the time. I have always had a lot of trouble focusing on this series so part of that might just be me, but I just felt like this was a mess and also not really a satisfying ending. I guess part of that is because she was already planning on starting a spin-off series, but I still feel like this should have had a more concrete ending because it is TECHNICALLY the end of the series. Well, I'm still not sure if this was a last book to the trilogy or a first book to a new series. Yes, it concluded the situations presented in the first two books but for me, it felt like it was already laying down the groundwork for a spinoff trilogy at the same. I didn't like the sudden additional shift to multiple POV (which wasn't the case in the prior books). Yes, it was nice knowing what Tijah felt and yes maybe their POV helped tell the story of what happened to the other daevas. But I th Well, I'm still not sure if this was a last book to the trilogy or a first book to a new series. Yes, it concluded the situations presented in the first two books but for me, it felt like it was already laying down the groundwork for a spinoff trilogy at the same. I didn't like the sudden additional shift to multiple POV (which wasn't the case in the prior books). Yes, it was nice knowing what Tijah felt and yes maybe their POV helped tell the story of what happened to the other daevas. But I thought the first two were pretty good in telling us the story without multiple POVs. What can I say? Kat Ross turned me into a puddle of emotions with her final book of the Fourth Element series! Action, betrayal, romance and demons conclude this story which can keep anyone captivated till the final page! Si conclude, per ora, la serie cominciata con "The Midnight Sea", ma il finale, con le sue tante trame non ancora riannodate, lascia un po' con l'amaro in bocca - ma per fortuna la stessa autrice informa di nuove serie, ambientate - udite udite! - in epoche un po' più prossime, data la longevità di daeva e legati; spero vivamente che anche questi nuovi libri verranno tradotti in italiano! Venendo a questo terzo volume, confesso di esser rimasto un po' deluso, perché l'ho trovato 3 stelle e mezzo. Venendo a questo terzo volume, confesso di esser rimasto un po' deluso, perché l'ho trovato un po' inferiore ai precedenti: in qualche modo mi ha catturato di meno; forse anche perché i vari personaggi sono spesso lontani gli uni dagli altri, quindi la "squadra" degli ex Water Dogs è smembrata. I am notorious for not finishing series. Despite my fangirl nature, I never have the guts and emotional stability to finish a journey with characters. Most of the time, I view the final book in a series as a funeral for the story and its beloved characters. The dread overwhelms my excitement and creates a paradox where I want to finish a series, but I am afraid of leaving a world behind. Thankfully, I felt the opposite going into Queen of Chaos. Ross expertly finished Blood of the Prophet with a I am notorious for not finishing series. Despite my fangirl nature, I never have the guts and emotional stability to finish a journey with characters. Most of the time, I view the final book in a series as a funeral for the story and its beloved characters. The dread overwhelms my excitement and creates a paradox where I want to finish a series, but I am afraid of leaving a world behind. Thankfully, I felt the opposite going into Queen of Chaos. Ross expertly finished Blood of the Prophet with a cliffhanger that even a person who loathes endings could not resist. Of course, I was devastated because the end one of my favorite series was nigh, but my heart was comforted by the insurance that Ross would not let me down. And let me tell you, she did not disappoint. There are five-star books, and then there are five-star books. The books that leave you without breath, holding back tears and smiling at the same time. Books that carry you so far into its world that you take a piece of it when you leave. There are five-star books and there are books that make you feel something. Queen of Chaos is both to me. Books this heart-wrenching and phenomenal remind why I continue to read. Even though I can read a dozen one-star books in a row, the hope of reading another book like Queen of Chaos keeps me going. The mixture of pure satisfaction, hope, and longing that I felt after finishing this book cemented it as not only a five-star book but a five-star series. This series is not something that you can read and forget. I will always have a piece of Nazafareen's stubbornness and unfailing heroism with me. I will remember Darius and his struggle to love himself and others. I will keep Tijah's feistiness and Myrri's quiet strength. Speaking of characters, none of Ross's creations could really be called flat, in my opinion. Even stock characters without a lot of screentime are thoroughly explored. My emotions were twisted and manipulated so that I never knew who was the real antagonist. I was kept on my toes throughout the storyline. Better yet, there was no useless filler to take up words. Ross made every character, every chapter, and every word count. In a mere 300 pages, my heart was shattered, tramped on, and put back together with the power of this world. All of the gushing aside, this is a series that all fantasy fans can enjoy. The world is unique with a brilliant magic system that I have never seen before. I felt as if I was plucked from my mundane suburban home and dropped in an exciting adventure in the deserts of magical Persia. One of my favorite parts of this series is the shift in perspectives. Every character gets their own voice, and I was interested in pretty much all of them equally. Even though I have a little bit more of a tender spot for Darius and Nazafareen, all of the characters' stories spoke to me in different ways. Queen of Chaos gives readers the unique experience to see a story from every single perspective, which is not seen in every novel. Anyone looking for a unique and mind-blowing fantasy novel should give this series a shot. The action-packed plot is perfectly accentuated with complex perspectives, cultivated diversity, and a healthy dose of romance. Ross's series has earned a coveted spot on my shelf alongside the rest of my favorite series. This review and other bookish shenanigans can be found on my original blog, Crazy for YA. Um, ok - my (short) review of this book just ... disappeared. WTF, Goodreads?! Ditto for the previous book in the series ... grrrrrrrrrrrrrrr! The final book in ” The Fourth Element” trilogy and when I saw there was a blog tour for this book, I immediately signed up for the tour. This is one of the best trilogies I’ve ever read!!!! Each book cover in this trilogy looks absolutely STUNNING!! Now for the book, if you haven’t read the first two books in this trilogy then WHAT ARE YOU WAITING FOR?? GO READ IT!!! If you are up to date till the 2nd book then this is a spoiler free review for you guys. As usual, the book starts where it was left off in the previous book with Darius, Nazafareen, Lysandros and Deliah on their way to the House-Behind-the-Veil to rescue Victor, save Balthazar, retrieve the fire which has the power to break/forge daeva cuffs and defeat queen Neblis. We also get two new POVs in this book- Tijah and Lysandros. For me, Tijah was the star of this book. She along with her companions embark on a journey to free all the daevas who are kept as prisoners and to break their cuffs. Reading each Tijah’s chapter made me respect her even more. Balthazar and Lysandros are my second favorite characters in this book. Balthazar has a grey personality where he is caught between the dark and the light. I could see more of his character development in this book. Whereas, Lysandros, the funny and mysterious one. He did make me smile with his witty comments. I would like to see more of him. For our star couple, Darius and Nazafareen, they had less chapters in this book compared to the previous books but each of their chapters were precious to me and they will always be one of the best OTP!! The word building in this book was awesome. I really loved the way Kat has described the Shadowlands with all its creatures and Behind the Veil. I could just imagine how that place would be in my mind. Now having finished this beautiful series, I cannot wait to get my hands on the spin-off and read about the next adventure of these wonderful characters. E anche questa serie giunge al termine. Se non fosse che è già uscito il primo volume della serie successiva e che questa lettura l'ho fatta in compagnia di amiche fantastiche, potrei essere triste. "Queen of Chaos" chiude una trilogia che per quanto mi riguarda considero una delle migliori mai lette. Non è priva di difetti - d'altra parte quale serie non ne ha? - ma è così carica di tutto ciò che amo in un fantasy che non poteva non avere un posto d'onore nel mio cuore. Cominciamo col dire che QoC parte subito dopo la fine di Blood of the Prophet (qui la recensione) e non lascia un attimo di respiro. Iniziamo questo nuovo volume ancora un po' sofferenti per ciò che accade alla fine di quello precedente, ma ci vuole poco prima di perdersi nelle spire dell'intreccio. Ad ogni capitolo la storia scorre ricca di eventi, di sentimenti, di azione. I personaggi che conosciamo cambiano, scompaiono, tornano, fanno scelte che non si condividono, vanno in cerca di un destino che non è il loro. Più di una volta ci siamo ritrovate, durante la lettura di gruppo, a urlare "Oooooh che teneri" e , subito dopo, "Oddio ma cosa stai facendo smettila subito" . Insomma, non è un libro in cui mancano le emozioni. I personaggi mi sono piaciuti tutti. Ho adorato Darius, Tijah e Nazafareen (anche se, tesoro mio, qualche mazzata in più non ti avrebbe fatto male). La loro è una crescita costante, sia da un punto di vista individuale sia come gruppo. Tijah, in particolare cresce molto in questo ultimo capitolo. Certo, Achaemenes - o come si scrive - fa la sua parte eh, ma capirete quando leggerete. I personaggi secondari, sia nuovi che vecchi, hanno ruoli importanti anche se marginali e riescono sempre a sdrammatizzare situazioni pesanti. Anche i villain mi sono piaciuti. Neblis è una cattiva coi fiocchi e devo dire che, sebbene un po' prevedibile, la questione cruciale non le toglie la cattiveria insita che si porta dietro. Moron... diciamo solo che sono contenta di com'è andata la sua storia. Balthazar, invece, è quello che mi ha lasciata un po' così. Voglio dire, non si può non apprezzarlo, però diciamo che la sua crescita come personaggio è stata un po' troppo repentina. E a proposito di velocità, questo è l'unico difetto che ho trovato nel libro. Il finale è affrettato in ogni modo possibile. Ci si aspettano cose che vengono a mancare, ma non è chiaro se manchino per scelta stilistica o per una necessità che verrà svelata nella serie dopo. Diciamo che, se non ci fosse la serie sequel, questo finale sarebbe un Happy For Now. Non è un finale malvagio, non ci sono (troppe) morti o troppa sofferenza, ma il cerchio non è nemmeno completamente chiuso. Sai che può esserci qualcosa dopo, ma non è nemmeno necessario saperlo. Ovviamente, però, ci sono anche cose belle belle che ti fanno dire "Sìììììì ne voglio ancora!". Insomma, se non si è capito, questa serie dovete leggerla. Se vi siete persi la recensione del primo libro potete trovarla qui. Nazafareen and Darius accompany Delilah and Lysandros on a dangerous journey through the shadowlands in order to rescue Victor from Queen Neblis's clutches. Meanwhile, Tijah and the children she has taken charge of plan an equally dangerous mission: They're headed for Gorgon-e Gaz to break out the daeva imprisoned there. And Neblis follows her own sinister plans, while Alexander's army marches to take on her forces. A brilliant conclusion to this amazing trilogy that I found quite by chance and a Nazafareen and Darius accompany Delilah and Lysandros on a dangerous journey through the shadowlands in order to rescue Victor from Queen Neblis's clutches. Meanwhile, Tijah and the children she has taken charge of plan an equally dangerous mission: They're headed for Gorgon-e Gaz to break out the daeva imprisoned there. And Neblis follows her own sinister plans, while Alexander's army marches to take on her forces. One of my favorite series so far!!! I need to read The Fourth Talisman series! Let's begin with the beginning, shall we? I was a little surprised when the book started with a new POV, and at first Tijah's voice was so different from Nazafareen's that it was challenging Writing a review for the last book of a series, (and one that connects with another series even!) it's always a very daunting task for me... I'm always unsure about how to review the book, what to mention, what not to mention because I'm always scared that I might end up spoiling something without meaning to! I am going to say it straight I so so so heartbroken the series is over! But hope came back to life after I read the bit at the end and there is a chance we get to be with some of my favorite characters again. I say this at the beginning on my review cause when I was reading the last chapter and epilogue, I was pretty much in tears. I have loved this series from book 1 and I really have a hard time letting series go when they complete. (We all know I have not yet recovered from the ending of the H I am going to say it straight I so so so heartbroken the series is over! So this is another heartbreaking moment where I have to say goodbye for now to my beloved Nazafareen and Darius and wait until we meet again in Kat’s other books. So let’s talk about Queen of Chaos, just like its predecessors, it is bloody well amazingly out of this world. This time, we get a lot of different PoV from most of our main characters the good ones and even a future ex-baddie. I felt like that way you were looking at the action from all angles and from all perspectives at the same time and I loved it! There were a few small twists here and there, nothing to make me fall off my bed but enough to make it a smashing finale and have a better insight into some things that were quite obscure from the beginning. If you have read book 1 and 2 then you are going to love this. I got choked up a few times and I blame Kat’s great writing for that (Trust me when I say that, it is in no way a negative). The series is amazing, this was a wonderful conclusion and I love that we may see our beloved characters again in the future in one form or another in other series or works. Now, if you have not read the series before, then I do recommend you get your hands on them stat cause they are really something else! So going from here, I am guessing (could be wrong of course) that the next book might be Book 2 following The Deamoniac (If you have not read it, you should) and maybe even another series? Time will tell and my friends you know by now that if it is written by Kat it is going to be so so so amazing, and I hope I will have the opportunity to review those books for all of us as well. Queen of Chaos picks up right where Blood of the Prophet left off (These books are so fast paced and each picks up where the previous left off and I recommend reading them all back-to-back.) Our hero’s are scattered after the fall of Xeros’ empire to Alexander. Tijan and a group of daēvas children travel across a barren landscape ravaged by the hordes of undead from Bactria. Nazafareen and Darius travel into the dominion searching after Victor, and eventually they get separated too. The tight gr Queen of Chaos picks up right where Blood of the Prophet left off (These books are so fast paced and each picks up where the previous left off and I recommend reading them all back-to-back.) Our hero’s are scattered after the fall of Xeros’ empire to Alexander. Tijan and a group of daēvas children travel across a barren landscape ravaged by the hordes of undead from Bactria. Nazafareen and Darius travel into the dominion searching after Victor, and eventually they get separated too. The tight group of former Water Dogs is no more, and each must find there own way in a world in chaos. You really need to read the first two books to be invested enough in this world to understand all the thread and currents in The Queen of Chaos. The story is complicated without being convoluted, and I think that’s really an accomplishment. Too many modern fantasy stories think they have to be so expansive, with so many characters, and so much going on that the reader can easily loose some of the threads or become disinterested. (I’m reading another series right now and the final book it giving me this exact problem, there is so much going on I can hardly keep it all straight and it spends a lot of time on story lines that don’t seem to be moving the plot forward.) Ross keeps this the book balanced while moving the action forward. There are several character development twist that came to me a quite a pleasant surprise. Without giving away any spoilers, the way things work out between Nazafareen and Neblis really caught my interest. It could have easily fallen into a fantasy troupe, but not only did it get turned on it’s head, the whole way things worked out for the bad guys was atypical, and I enjoyed that. Of course, there are new monsters, big battles, and plenty of action in the book too. Wow! Kat Ross knows how to write an epic. The twists and turns the books takes as it leads up to the final conflicts swept me along. The world of the Forth Element yielded up some more of it’s secrets, but not all. It left me wanting more. Wanting to dig deeper and spend more time in the fantasy version of Persia that Ross built up. I absolutely love this! This book is a stunning conclusion to the Fourth Element series and I’m sad to see it end! Gaaah!!! Though I believe that I would feel this way no matter how many books would have been in the series. I also liked how Ross explored other characters in the story. Though Nazarfeen is still the main focus, the other characters gained a lot of screen time in this one and their development was absolutely amazing! They all toed the line between good and evil and I LOVED THAT! I mean, I was loving them one minute and hating them the next, though I understood why they were doing what they were doing. DISCLAIMER: I received a copy of this book as part of this tour. This is amazing! Such a great conclusion to the trilogy. I found myself lost in this book world and enjoying the characters. Kat Ross does an amazing job delivering a fantastical story that will stick with you. I had a lot of fun reading this book (series), and now that I have, I am really gonna go and have a look at Kat Ross' other work. One never knows when they might come across the next favorite. This whole series has been amazing from book one each book gives you just a bit more of the story and none of the i fee are lacking in the intensity that builds as you read each book. The covers are all stunning and very much scream you love fantasy pick me up read me, travel with me to a world you known of in your dreams. I am fan and feel honored to be allowed to share this wonderful series with all of you.